Housebroken: I’m working on it! 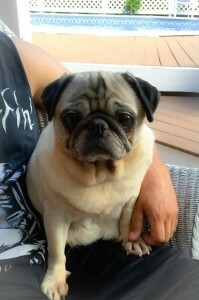 Bette is a sweet little girl with an easy going personality. She loves attention and is willing to let anyone love on her. She is very sociable and loves other dogs and also children. She’s learning how to master the art of afternoon snoozes in the sun and enjoying the freedom of running around the back yard. She’s working on her potty training skills and does well when following our other pug Linus outside to go to the bathroom. Bette has only two teeth remaining so she will forever be on soft food. 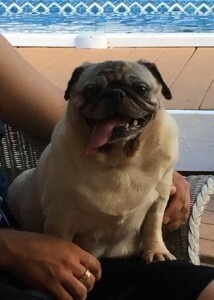 However, that doesn’t stop her from having a typical pug appetite. Bette would fit in well with a family that has a lot of love to give her. She would be a great companion for someone who lives alone and wants some company. She can be an escape artist so she will need to be on a leash at all times. Ideal would be fenced in yard. Interested in adopting Bette Davis? 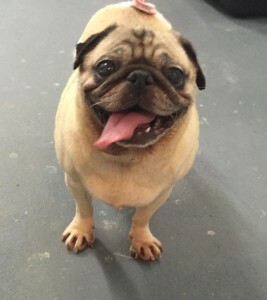 Please fill out an application at: www.pugpartners.com/adoption-application Bette Davis’ minimum adoption donation is $275.